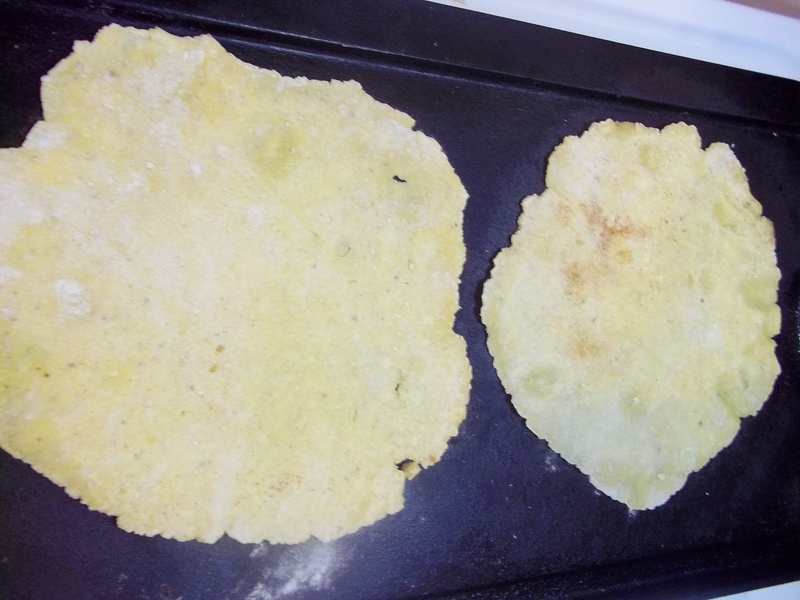 I have made plenty of flour tortillas at home, but this was the first time in over 20 yrs. that I have attempted to make corn. The recipe I used years ago was a sort of corn crepe recipe. They were good, but oily and soft. I wanted to make corn tortillas from scratch that were dry and grainy like the ones I have had at authentic Mexican restaurants. I used cornmeal instead of Masa, and don’t have a tortilla press so rolled them. It was difficult to roll them and I had to use quite a bit of flour to keep them from sticking to the pin and board, but cooking them on iron and using them for enchiladas made up for the quirks. I will do this again, often, but will be looking into buying a tortilla press. Flour for rolling if you don’t have a press. Sift together salt, flour, and cornmeal. Mix in a little water at a time to make a dough. Allow the dough to rest, covered tightly, for 30 minutes. Roll dough into a log and cut into 10 equal pieces. Roll each piece into a ball. Roll on floured surface with plenty of flour on the rolling pin into a thin round. Cook on a very hot cast iron griddle or tortilla pan 30 seconds. Turn and cook for an additional 30 seconds. Stack finished tortillas on a plate and cover with a slightly damp towel until ready to use.